Can you confirm these amateur observations of Amphisbaena caiari? Type locality: left side of Madeira River (ca. 08°47’S, 63°57’W, 90 m elevation), Usina Hidroelétrica Santo Antonio, Porto Velho, Rondônia, Brazil. Types Holotype: MZUSP 101727, collected by biologists of Arcadis Tetraplan Consultoria Ambiental LTDA. Paratypes: MZUSP 101695–101697, 101715–101718, 101720, 101722–101726, 101728–101733, 102226–102236, 102238–102263 (ca. 08°47’S, 63°57’W, 90 m a.s.l.) from left side of Madeira River, Usina Hidroelétrica Santo Antonio, Porto Velho municipality, state of Rondônia, Brazil. MZUSP 101602 (09°35’50.43”S, 65°20’21.81”W, 113 m a.s.l., SAD69) from right side, and MZUSP 104081 (09°26’47.35”S, 64°49’29.93”W, 160 m a.s.l., SAD69) and MZUSP 104237 (09°27’13.53”S, 64°51’2.27”W, 145 m a.s.l., SAD69) from left side of Madeira River, Usina Hidroelétrica Jirau, Porto Velho municipality, state of Rondônia, Brazil. All collected by biologists of Arcadis Tetraplan Consultoria Ambiental LTDA, October 2010 to July 2012. Diagnosis Diagnosis: (1) A small sized species, maximum SVL = 157 mm; (2) two precloacal pores; (3) precloacal pores arranged in a continuous series; (4) snout rounded in lateral and dorsal views; (5) tip of tail rounded; (6) body annuli 233–250; (7) caudal annuli 20–24; (8) autotomy sites on caudal annuli 6–9; (9) 10 dorsal and 12–14 ventral segments per annulus at midbody; (10) postmalar row absent; (11) suture between frontals slightly smaller than parietal and nasal sutures; (12) tail short relative to body length (tail length/body length = 0.10). Comparisons: Characters from other species are presented in parenthesis. Among the South American two-pored Amphisbaena species, the rounded snout immediately distinguishes the new species from A. cerradensis (Ribeiro, Vaz-Silva and Santos Jr, 2008), A. maxima (Ribeiro, Nogueira, Cintra, Silva and Zaher, 2011) (dorsoventrally compressed, shovel-like snout), A. acrobeles (Ribeiro, Castro-Mello and Nogueira, 2009) and A. bilabialata (Stimson, 1972) (laterally compressed, with a conspicuous vertical keel). The rounded tail diagnoses it from A. absaberi (Strüssmann and Carvalho, 2001), A. bahiana Vanzolini, 1964, A. roberti Gans, 1964, (a sharp terminal vertical keel on tail), A. leeseri Gans, 1964, and A. bilabialata (a blunt terminal vertical keel). The presence of two pores arranged in a continuous series distinguishes the new species from A. absaberi, A. anomala, A. bilabialata, A. carli Pinna, Mendonça, Bocchiglieri & Fernandes, 2010, A. cerradensis, A. hiata Montero & Céspedez, 2002, and A. maxima (scales bearing pores separated from each other by one or more non-pored scales). 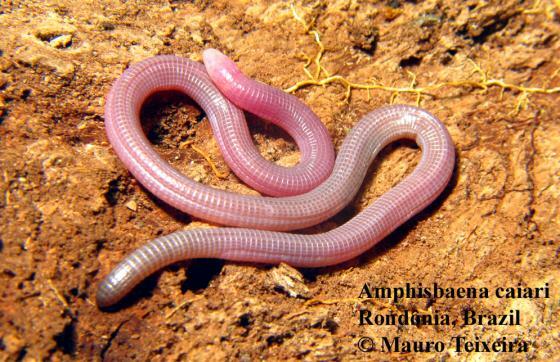 Among the remaining two-pored, South American species of Amphisbaena, the occurrence of 233–250 body annuli distinguishes the new species from A. anaemariae Vanzolini, 19697, A. brevis Strüssmann & Mott, 2009, A. crisae Vanzolini, 1997, A. darwini Duméril and Bibron, 1839, A. dubia Müller, 1924, A. heterozonata Burmeister, 1861, A. mitchelli, A. neglecta Dunn and Piatt, 1936, and A. silvestrii Boulenger, 1902 (< 231 body annuli) and from A. miringoera Vanzolini, 1971 (> 250 body annuli). The occurrence of 20–24 caudal annuli differs from counts of A. anaemariae, A. brevis, A. dubia, A. heterozonata and A. neglecta (< 20 caudal annuli) and A. mitchelli (> 26 caudal annuli). The occurrence of the autotomic site in caudal annuli 6–9 differs from the condition found in A. anaemarie, A. brevis, A. crisae, A. dubia, A. leeseri, A. neglecta and A. silvestrii (autotomy site absent or in an anterior to caudal annulus 6). The presence of 10 dorsal and 12–14 ventral segments differs from all other two-pored species (> 10 dorsal or > 14 ventral segments; < 12 ventral segments in A. crisae), with the exception of A. silvestrii (10–12 dorsal and 10–14 ventral segments). Also, the new species can be distinguished from A. darwini, A. heterozonata, and A. lumbricalis Vanzolini, 1996 by having a fixed number of 2 pores (2–6 pores), and from A. dubia (0 or 2 pores). Additionally, A. caiari sp. nov. can be distinguished from A. crisae, A. darwini and A. dubia by the absence of postmalars (present) (Fig. 3). From A. anaemariae, A. crisae, A. darwini, A. heterozonata and A. lumbricalis, the new species differs by having a suture between prefrontals that is smaller than the suture between the frontals (suture between prefrontals larger than between frontals) (Fig. 3). In having having TL/BL = 0.10, it differs from A. anaemariae, A. darwini, A. mitchelli, A. silvestrii, and A. crisae (0.13–0.16 TL/BL) and A. carli (0.06 TL/BL) (Fig. 4). 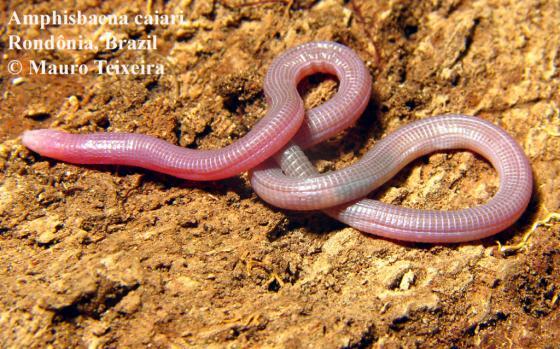 A few additional species were also recorded in the same geographic region where the new species was found: Amphisbaena alba Linnaeus 1758, A. fuliginosa, and A. cunhai Hoogmoed & Avila-Pires, 1991. Amphisbaena caiari sp. nov. can be distinguished from those species by the presence of two pores (> 4), the occurrence of 20–24 caudal annuli (≥ 24 in all species except A. alba, which has ≤ 21); and the presence of 10 dorsal and 12–14 ventral segments (> 14 dorsal and ventral segments). Also, the maximum known SVL of 157 mm in the new species is smaller than in other species (> 400 mm SVL). Etymology The specific epithet caiari is the ancient indigenous name, from the Tupi language, for the Madeira River, whose banks are inhabited by the new species.